5 Days and 4 Nights Package tour with accommodation exploring the famous Chiang Mai and Chiang Rai Provinces in Northern Thailand. Chiang Mai, is one of the biggest cities in Thailand and is surrounded by a ring of mountains, and it has a wealth of over seven hundred years of fascinating history. 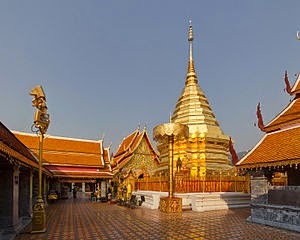 Chiang Mai is quite a stark contrast to Bangkok in the South, with its very own unique blend and style of distinctive culture, arts, festivals, and traditions as well as an exciting mix of local, ethnic communities, from all over the world. Chiang Mai recently has been voted one of the top Asian destinations to live in and with its blend of old and modern styles wrapped up in this fascinating and vibrant city in the mountains. Chiang Mai is steeped in history, and wherever you go in the city you will see constant reminders of its sometimes violent past. In 1557 the Burmese attacked Thailand, and completely destroyed Siam and turning Chiang Mai into a vassal state –subordinate state of its conquerors. The next two hundred years Chiang Mai was a broken state and was cut off from the rest of the world and neglected by its rulers – it disappeared from the pages of history. Times move on and you can’t keep a great city down forever, but the Burmese were not done just yet, and so, in 1767 the Burmese struck at the heart of Siam and this time reducing the great city of Ayutthaya to a pile of rubble and from that, it never really recovered, politically anyhow. The capital is as we know it today and was recreated at Bangkok. Slowly the kingdom of Siam recovered under the new Chakri Dynasty but there was some still deep scars to be healed between the two countries. Chiang Mai was deserted for over twenty years following the Burmese aggressive onslaught. However, it was gradually repopulated and eventually joined back into the loving arms of Thailand -as it was known then Siam. Chaing Mai was very difficult to reach from many parts of Thailand and the river was the main route up there, even so, that was a slow and arduous journey. So the then Prince of Chiang Mai was virtually an independent ruler, and answered to know one from the bigger city in the south. In 1867 the very first American Presbyterian missionary finally reached the north from Bangkok. The journey actually took him three months to make. 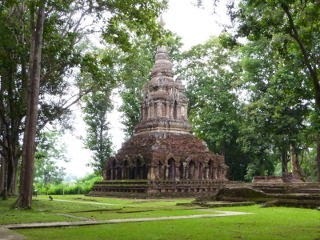 The name McGilvary's mission was given and brought in a more modern era to Chiang Mai. The mission tried to spread the word of God, but it mainly fell on deaf ears, although he did have more success introducing the locals to a better education and medicines that they had never tried before. Chiang Mai these days is a very different place to what it was back then, apart from the wars and fighting, it takes significantly less time to get there and with many flights from most of the main airports, which fly directly into Chiang Mai from Bangkok for example it takes little over an hour to reach the beautiful city and Chiang Rai is only a little further. Once there, there is always something to do or go and see, and in February every year, there is a flower festival, this is to coincide with the more pleasant weather, suitable for growing such beautiful flowers. Also Tam Bun Khan Dok festival starts on the waning of the moon of the six lunar month and last for a week or so. There is a wonderful Elephant Nature Park which is situated about 60 km north of the city, only about an hour drive. The Elephant Nature Park is home to approximately 30 rescued elephants. The Hill-tribe tourism and trekking business is possibly the main reason people want to go to Chiang mai. Many tour companies organized treks among the local hills and forests on foot and on elephant back, where you can visit some of the local tribes who still to this day practice their ancient traditions. Which include the very famous from the Akha, Hmong, Karen, and Lisu tribes. There are museums and temples and countless shrines to Buddha to see there is trekking to undertake, markets to shop at, the nightlife is thriving with some fantastic restaurants and bars as well as other eating places available. There is also a strong expat community up there so western food is plentiful too. 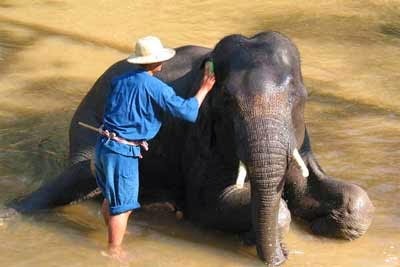 There really is far too much to list, the best way find out about Chiang Mai is to go there and see for yourself. It is really a most beautiful city, and the people are even friendlier than in the city of Bangkok, spend as long as you can and see what everyone is talking about in Chiang Mai, a city steeped in tradition, with an amazing history, you simply cannot go wrong. Riverside Restaurant: On the river front. Thai, northern Thai and western food. Good prices. A main dish Thai about 80 baht. A cheese burger 110 baht. A large beer 120 baht. A bottle of wine from 800 baht. Live music from 9.30pm. Three bands each night playing covers. They are pretty good and very popular with Thai’s. It’s a cool place to hang out with locals. Advance booking is essential in high season. Anusorn Market: Just off the night bazaar. Cheap eats. Everything available from small restaurants. Noodles, curry and rice, seafood, northern sausages etc etc. Local favourite is Kao Soi, yellow noodles with chicken, beef or pork in a curry soup. Whole Earth Restaurant: Central Chiang Mai’s best veggie restaurant. Baan Suan: 10-15 minutes out of town down a scenic teak tree lined road. The restaurant was built by one of Thailand’s top architects (designer of Shangri La and 4 Seasons hotel) Ajarn Junlatat Kitibut. Lovely setting on the river, popular with the Thai royal family and very good value for what it is with dishes starting at about 150 baht.